Did you know that you already have a security system in place? That's right security starts right at your front door. You must understand that the door is your first and last barrier to protect your home and family from a dangerous confrontational situations. In addition to good locks , your best security investment is to be able to peek out your door before opening it to a stranger to determine who is there. 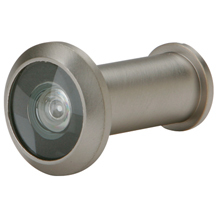 Peepholes only give you a very limited view of who is outside your door, so installing one that has a wide angle viewer is going to provide you with a clear picture of what's going on. Something as simple as a peephole has become the first level of protection and security against anauthorized entry verifciation that should be installed on every door so that your family can determine who is there..
Our viewers can also be installed on doors with windows, we simply install it on the solid side of the door at the correct hight basicly in the same line as your lock set but higher.